I’ve been trying to get caught-up on my reading for my Classics Club book list that I started almost 5 years ago. This also involves blogging about the books I’m reading in the hope that we can spread our love for classic literature all over the internet. Interestingly, the last two books I read have some similar themes and it made sense to group them together. Which is good, since book reviews aren’t the main focus of this blog. 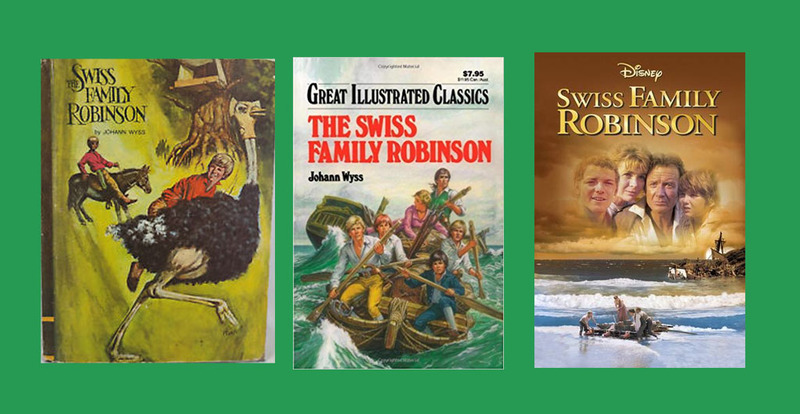 There’s a good chance that if I mention The Swiss Family Robinson you know what I’m talking about. This story of a castaway family has enchanted readers since its first publication in 1812. Even if you haven’t read a version, there’s a good chance you’ve seen or at least heard of one of the film adaptations. I don’t remember if I first came across this story as a Great Illustrated Classics book or through the 1960 Disney film. I’m sure one led quickly to the other. Shortly after that, I found a more “grown-up” version of the book in my favorite book store. It was a 1968 edition that was about 12 tall by 8 inches wide, and the margins were filled with illustrations of animals and explanatory notes. I read it so much the book literally fell apart. When I started looking for a replacement copy, I realized this book was originally written in German and that there was more than one English version to choose from. This led to a startling revelation. I realized after my last Classics Club post that I’m bad at writing book reviews. I’d intended to just write a short “this is what the books are like, this is what I thought” post for Elizabeth Gaskell’s novels but it turned into an essay on what makes a strong female character and the state of modern feminism. I think I’ll give up on book reviews. Apparently I can only write thoughtful, rambling essays. That’s not a bad thing though, right? These are classics, after all. People have been writing reviews of them for decades or centuries. If you want to find out about the plot you can go on Goodreads. I’d much rather talk about the ideas prompted by these great books. And I think you might rather read about that, too. I feel like The Last Unicorn by Peter S. Beagle * should have been a re-read for me, but this was the first time I’d read it. You’d think as much as I love unicorns and fantasy novels I’d have picked this one up earlier. Especially considering how much everyone loves it. Even the guy who wrote the best fantasy book I’ve ever read says, “The Last Unicorn is the best book I have ever read. You need to read it. If you’ve already read it, you need to read it again” (Patrick Rothfuss, author of The Name of the Wind *). On the surface, The Last Unicorn seems like a pretty simple book. A unicorn overhears two men say there aren’t any unicorns left in the world. Worried that she might be the last one, she goes out searching for other unicorns and meets with the sort of adventures you’d expect in a fantasy novel. There’s a wizard, a merry band of outlaws, a wise woman, a curse, a wicked king, and heroic prince, a talking cat, and a beautiful princess. But there’s so much more than that, too. There’s a lot going on in this relatively short book, so I’m just going to focus on one theme that I found particularly interesting. When the unicorn first sets out on her search, I expected that problems would arise when people spotted a unicorn walking down the road. But all they see is a white mare. The unicorn is puzzled. “I suppose I could understand if men had simply forgotten unicorns, or if they had changed so that they hated unicorns and tried to kill them when they saw them. But not to see them at all, to look at them and see something else — what do they look like to one another, then? What do trees look like to them, or houses, or real horses, or their own children?”(p. 11). I just started rereading Watership Down by Richard Adams last night. Normally I wait to write about the books on my Classics Club list until after I’ve finished them, but I’m also rereading Elain Aron’s The Highly Sensitive Person In Love and I was struck by a connection between the two books. In her research on high sensitivity (also known as Sensory Processing Sensitivity), Aron discovered that it’s found in 15 to 20% of the population. And it’s not just humans. The trait “can be observed in all higher animals — mice, cats, dogs, horses, [and] monkeys” at about the same percentage. I’m going to add rabbits to the list as well. 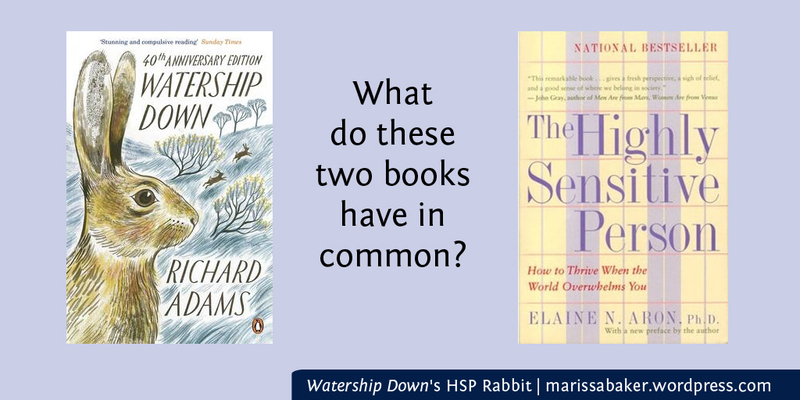 Research on HSPs had barely started by the 1970s, so I doubt Richard Adams would have been familiar with it as a scientifically validated trait when he published Watership Down in 1972. I think he was writing about it anyway, though, with his character Fiver. When publisher Rex Collins acquired the book, he wrote to a friend saying, “I’ve just taken on a novel about rabbits, one of them with extra-sensory perception. Do you think I’m mad?” Fiver’s insights do go beyond simply being a highly sensitive rabbit, but it’s also true that Fiver would pass the HSP test. Easily overwhelmed by strong sensory input? Check. Aware of subtleties in the environment? Double check. 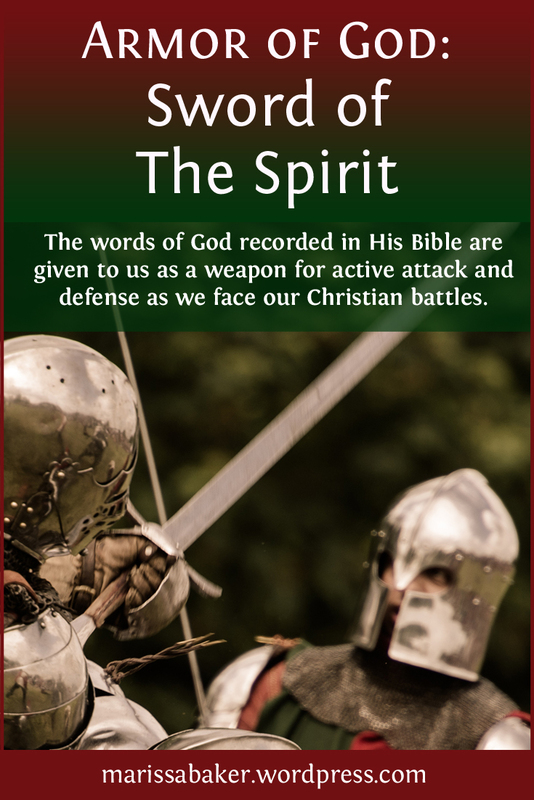 Made uncomfortable by loud noises, startles easily, has a nervous system that feels frazzled, and so on down the list. As a Highly Sensitive Person myself, I know that feeling all too well. The heightened awareness of the smallest noise. The tension so familiar you barely notice it until an unexpected sound startles you out of your chair (in fact, right after writing this sentence I jumped at a Facebook notification on my phone). And it’s kind of nice to see a character like that in a book, especially one with friends who don’t tell him he needs to change. They accept him for who he is, work with his weaknesses, and appreciate his unique strengths. Can you think of any other HSP characters in fiction? Click here to get a copy of Watership Down . Please note that this is an affiliate link. This means that, at no additional cost to you, I will receive a commission if you click on the link and make a purchase.